Plans and dreams for a Dalek-led franchise without the Doctor present had been circulating since the earliest days of Terry Nation’s creations’ televised success and popularity, but after a failed American spin-off attempt- the unproduced pilot script also being adapted for the audio medium in ‘The Destroyers’- it took until 2001 for Big Finish to finally make that adult-oriented space opera dream a reality with the aptly-titled Dalek Empire from Nicholas Briggs. As the saga begins in ‘Invasion of the Daleks,’ the Milky Way is at peace with the formation of the Earth Alliance after centuries of struggle, but an unprovoked Dalek invasion threatens to tear apart the very fabric of the galaxy. Opening on the planet Vega VI just before the invasion, the audience is afforded just enough time to understand the universe within which this series of events takes place while gaining a brief introduction to lovers Susan Mendes and Alby Brook whose lives are about to take very different paths. With the brief time afforded their characters together, Sarah Mowat and Mark McDonnell don’t necessarily have the electric chemistry instantly needed to sell their love, but Mowat quickly rebounds by crafting one of the more fascinating characters in Big Finish history as she refuses to leave her family behind and begs Alby to save himself, quickly showing the mental fortitude and wherewithal to stand up to the imprisoning Daleks by asking them why exactly they are keeping her fellow prisoners and her alive when they so clearly want to kill them all. As her impassioned pleas gain her audience with the Dalek Supreme and lead to better working and living conditions for the slaves as the manipulative Daleks seek only to gain a more efficient mining workforce with her as a vocal motivator and supporter, a fascinating game of mental chess and give and take unfolds even as Susan holds absolutely no power. Fortunately, while Mendes’s so-called ‘Angel of Mercy’ rightfully takes centre stage during the worst of this invasion, the supporting characters introduced are just as engaging, and this includes the emotional Alby who was working undercover on Vega VI as a pawn for the Earth Alliance due to past misdeeds hanging over his head. Coming to terms with his own insecurities and cowardice after leaving the woman he loved, McDonnell also acquits himself quite well as the story progresses, and the legendary Knight of Velyshaa Kalendorf he was looking for is revealed to be a prisoner alongside Susan. Gareth Thomas doesn’t have too much to do here aside from establish his character’s telepathic ability and seemingly greater knowledge of circumstances even as he asks for death, but it’s clear that this character will have a much bigger role to play in events to come. The story as a whole does jump between different storylines a bit too often to truly give a single sense of cohesion, but this also affords a grand sense of scope, and the entire production is brimming with confidence from the start. Though a substantial part of the tale is understandably dedicated to exposition and introduction, the brutal cunning and menace of the Daleks is already immense, and all of the pieces are successfully introduced for a long and exciting journey. Alby Brook and Gordon Pellan are following their best information to find Susan Mendes in Dalek-infested space in ‘The Human Factor,’ trying to uncover the truth behind rumours that she is working for the Daleks as murmurs of defiance throughout the expanding Dalek Empire proclaiming ‘Death to the Daleks’ begin to grow. Mowat again shines as Mendes who hates herself for saving so many people with the end result being only a further advancement of the Dalek plans. She understands implicitly that he Daleks have no soul or emotion, but as she gains their confidence and a seeming modicum of deference, she frightfully begins- purposefully or not- showing shades of Dalek herself as she purposefully convinces others to sacrifice themselves to ensure and advance the burgeoning rebellion’s aims. This is a nice contrast to the man she had fallen in love with, and Alby continues to develop as an affable everyman who joined the army to escape a tortuous childhood and had no real hope in his life until he met Susan as she was on Vega VI. The cliffhanger in which Alby finds himself under fire from Earth Alliance Security is immense and provides a suitable emotional end to a story that showcased the destructive capabilities of the Daleks as well as the much stranger sight of the Dalek Supreme suspending an attack in order to ensure Susan Mendes’s survival. Though the scenes on Guria are quite flatly-delivered compared to the robust emotions on display elsewhere, the story’s hints that Susan and the telepathic Kalendorf are spreading secret rebellious messages that must be protected no matter the cost as well as the introduction of the very shrouded Project Infinity from the Earth Alliance show that the series has firmly found its footing and continues to wonderfully develop the many disparate key viewpoints in a much more consistent manner with plenty of action, emotion, and characterisation alike. Earth Alliance Security commander-in-chief Tanlee is intent on finding Alby in ‘Death to the Daleks!’ as the only hope for humanity’s salvation lies in the Lopra System with Project Infinity that still nobody will discuss. Meanwhile, as Susan decides to take control of events but fears that all of her actions may have been in vein when called to meet the Dalek Emperor, Briggs takes the audacious step of making his lead heroine a truly unlikable presence, one who seems to revel in the power she has gained over the years while helping the Daleks hasten their conquest across the galaxy and stymieing any substantial glimmer of rebellion with well-crafted words and placations. She believes herself to be the sole reason the Daleks have been so successful and has taken steps to ensure that she is afforded a semblance of privacy, steps that backfire spectacularly as more deaths result and the Daleks firmly prove just how manipulative and intelligent they are by tricking her into revealing Kalendorf’s importance to her plans when they tell her to choose who must die between her newer companion and the man she proclaimed to love. Even though the Daleks seem to grasp at least a basic notion of emotions and how to use them to their advantage, Susan must admit to herself that her relationship with Alby never really got started and that she must stay committed to her goal of ensuring that the slaves are willing to revolt without fear of death since numbers are the only advantage they have. Through it all, though, this is the story where Gareth Thomas excels as Kalendorf, able to effectively portray the anguish of a man who has been working for the creatures he abhors most while always hoping that their secretive true intentions are discovered so that his involvement in the atrocities he must continually witness can finally end one way or another. Mowat and he have had a great chemistry throughout, and the fissures forming in their characters’ relationship provide a tremendous personal look at the Dalek’s ever-continuing conquest. Yet as the Earth Alliance continues to suffer ten losses for every one of the Daleks’ and with the President ordering for the evacuation of the solar system, the true consequences on a galactic scale have never been so palpable, even before the slaves on a thousand Dalek-controlled worlds take the fight back to their masters as Susan pays the ultimate price. The Daleks have infiltrated all realms of the Earth Empire and know even of the secret Project Infinity, setting the scene for a resounding finale in this truly compelling space opera. With the Daleks’ sights set squarely on Project Infinity, humanity’s last hope that could well turn into its ultimate harbinger of destruction, the Seers of Yaldos have a sad story that Alby and Kalendorf must hear in the appropriately-titled ‘Project Infinity.’ After leaving Kalendorf, Susan had gone to the Seers and formed a permanent link with them, allowing a fascinating insight into Susan’s ultimate betrayal of the Daleks that puts the events of the previous stories into firm context. This is a time when Alby has lost the will to continue on because of the loss of Susan whom he fought so hard to find and a time when the Daleks are seemingly letting the humans win battles they have no right to win in order to instill an overinflated sense of confidence in their enemies. Despite their overwhelming might, however, the Dalek Emperor knows that the intricacy and complexity of the human emotional mind and instinct will always emerge victorious against his forces, and it’s for this reason that their obsession with Project Infinity that they learned of initially through the Kar-Charat library of ‘The Genocide Machine’ and more recently through small implants that create unwitting and undetectable operatives has manifested so strongly and progressed so quickly. The Earth Alliance turning Dalek technology against its foes and gaining an upper hand through a sudden influx of Dalek transmissions and tactical date is very well realised, but Project Infinity hopes to take tactics one step even further by glimpsing into parallel universes to find the best tactics for the human rebellion to employ. The Daleks have even grander plans, however, and hope to form a physical bridge with the universe of their own choosing in which the Daleks reign utterly supreme, adding those victorious versions to their own ranks and accomplishing the absolute Dalek reign in this universe as well. This is a story that follows a very logical path but never shies away from delivering a few truly shocking moments, all culminating in a superb cliffhanger that goes squarely against all known assumptions. There was a tremendous amount riding on this Dalek-centric series without the Doctor present as a known force for morality and good, and it’s fair to say that Nicholas Briggs has delivered on all fronts to create an increasingly satisfying piece of drama that tells a resounding and surprising tale in its own right while laying the groundwork for a much more expansive saga yet to come. 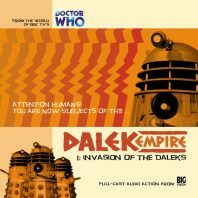 With great performances, direction, and sound design to bolster the Daleks at their most dangerous and manipulative before ambition gets the best of them, the first series of Dalek Empire is an experiment that is a testament to the confidence Big Finish had even in its earliest years.